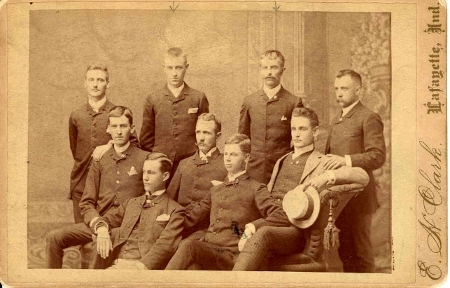 Since 1875 the Delta Delta Chapter of Sigma Chi has been an important part of Purdue University. From our founding to the present, our proud history speaks for itself with academic achievement and leadership on the Purdue campus. Many of our brothers have had very successful and distinguished careers in business, engineering, medicine, and countless other endeavors, the common bond of our brotherhood re-mains, along with our shared principles and values. Most of us trace the roots of our success to one place: Sigma Chi. The early training we received through our Fraternity, including leadership skills, organizational skills, social skills, teamwork, and character, has been integral to our personal success. In 2012, Bernie Sergesketter and Jim Dora, both Significant Sigs and life-long contributors to the Delta Delta chapter of Sigma Chi published a video that highlights the our chapter’s long heritage as one of the first chapters at Purdue University. You can watch this video on the Delta Delta History page.